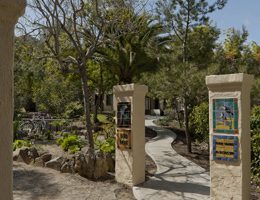 Bird Park is a 24-unit, USDA subsidized, affordable community located in Avalon on Catalina Island. The property is currently accepting applications for the waiting list. This property does not accept Housing Choice (Section 8) vouchers. Bird Park is nestled in a beautiful canyon area surrounded by mountains. Two, three, and four bedroom units are available and the community features a large activity room with full kitchen amenities and a TV. The room is frequently used for monthly parties and holiday celebrations. The community also boasts a playground area with swings, slides, picnic benches and a basketball court. Lush landscaping and winding sidewalks wrap around the entire property. A preschool is conveniently located adjacent to the complex that can provide childcare for working parents. Bird Park is located approximately one mile from the downtown shopping area and is within walking distance to restaurants, a golf course and public school.